I awake early to a silence so profound for a moment I forget where I am and wonder what has become of the kinetic city. The sun reaches its fingers across the sky painting it a myriad of pale colors as it does so. From the courtyard, the morning doves begin to chatter and I realize that the music of these French doves is much louder and the deep-throated cooing is a trifle more insistent. After breakfast, Dolores and I head out toward Doué-la-Fontaine. 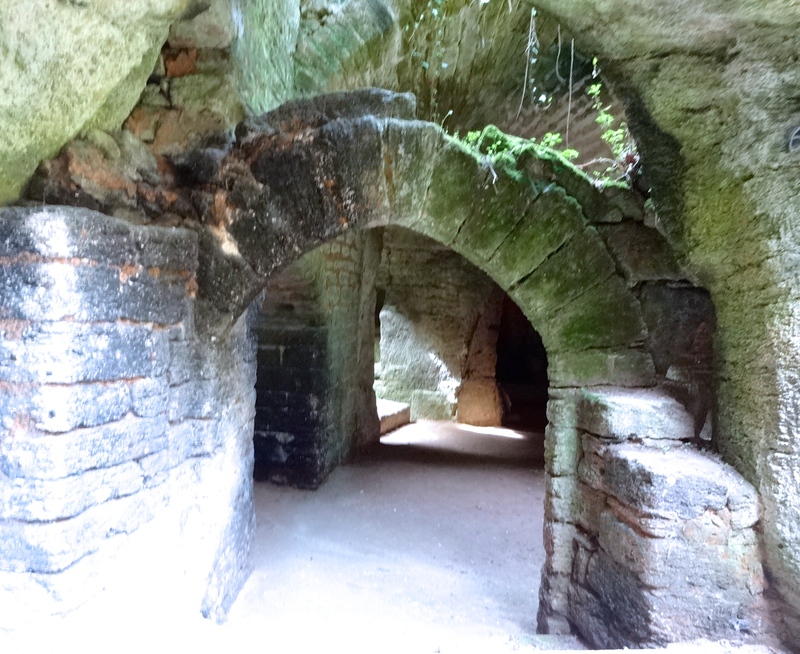 We have decided to check out the famous troglodyte caves of the Loire Valley. Millions of years ago, the sea covered this part of France and upon its retreat, it left a thick bed of white stone called tuffeau, the same stone that exists underneath Saumur. Soft and easy to carve, many buildings in the Loire Valley are built using this stone. One of the caves we will visit dates to 600 and it’s said that the quarrying of the tuffeau initially created the cavities that would become the troglodyte caves and homes. We follow the river, heading west out of St-Martin-de-la-Place to a small village called Les Rosiers-Sur-Loire where, as its name implies, we see roses upon roses flourishing. 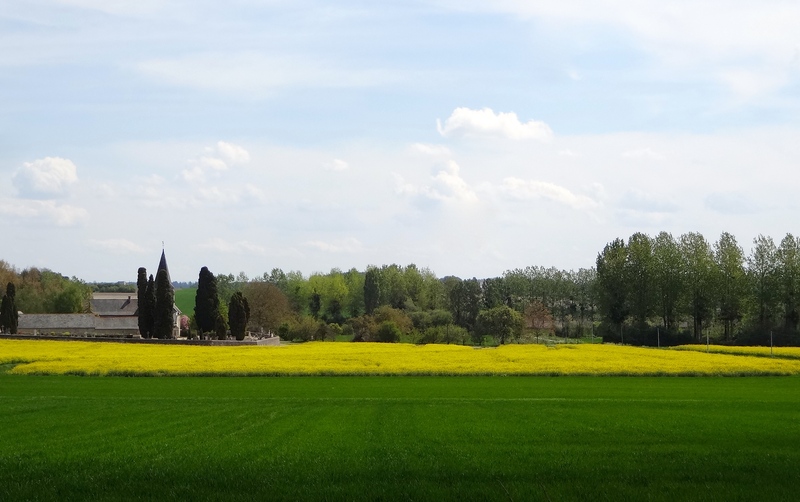 Here, we cross the river and head south through the beautiful valleys lush with bright yellow rapeseed. 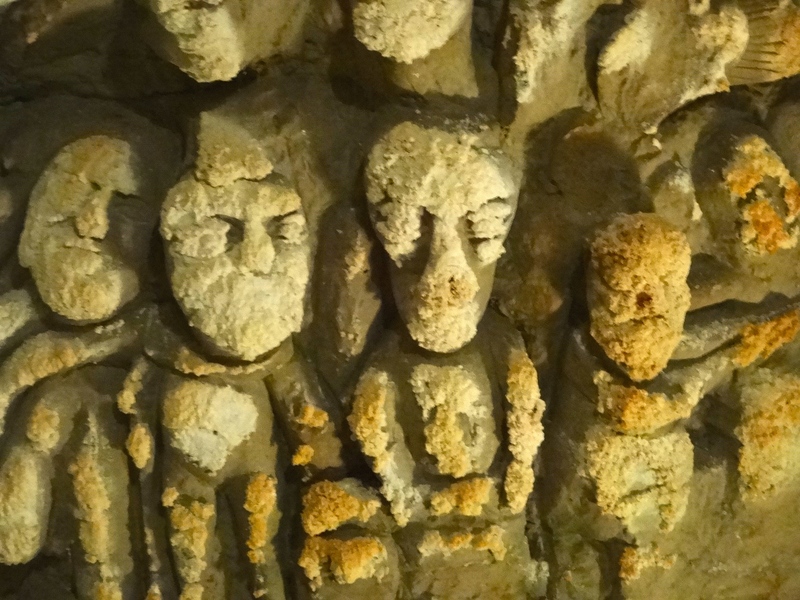 Upon entering the very small, but clearly ancient village of Dénezé-sous-Doué, we see a sign for La Cave aux Sculptures and make a last minute decision to stop. 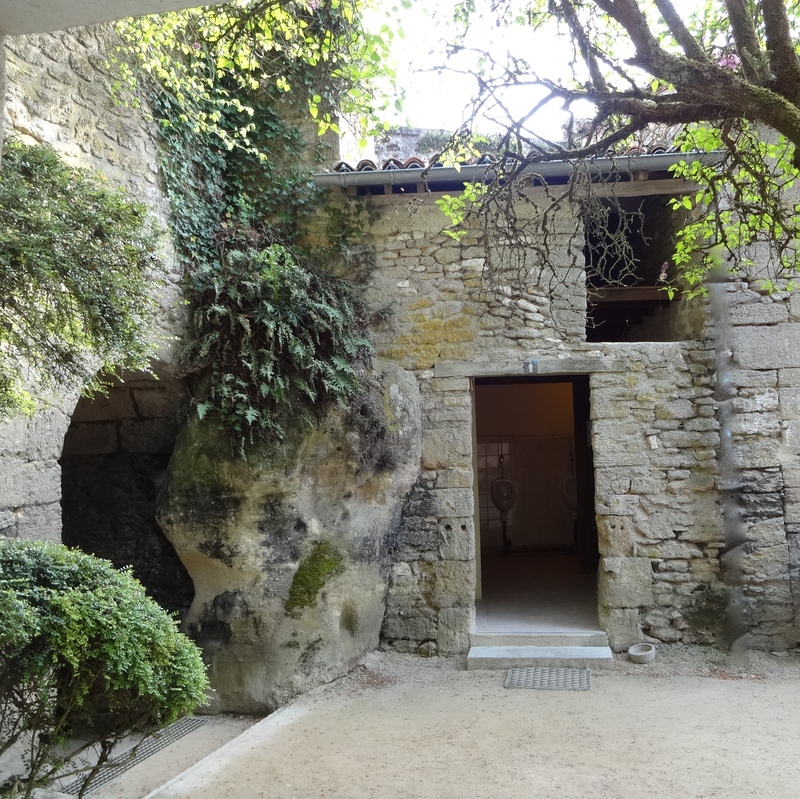 We head into a small wooden structure and pay for tickets, purchasing our tickets (at a discount) for a later tour of the Troglodytes et Sarcophages. As it turns out, we are the only people here in this fairly small cave that dates back to the era of Catherine de Medici when the stone masons would meet secretly in the shadows and confines of this cave, making political statements in the form of these sculptures that line the walls of the large inner sanctum. The young woman from whom we purchased tickets appears and serves as a spontaneous guide. She tells us the story of how the caves were hidden for several hundreds of years and discovered by two local children. She points out the ‘more important’ sculptures and reveals their meaning. 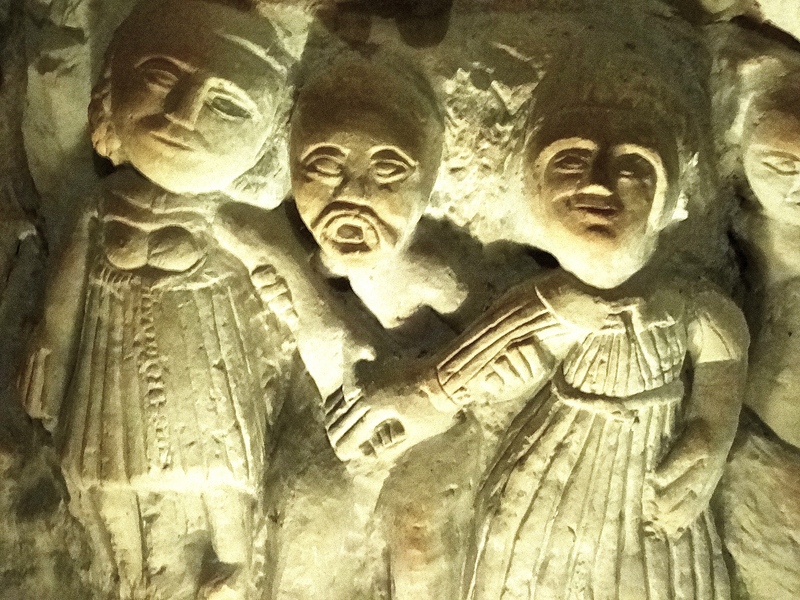 These have been identified by archaeologists through carbon-dating and based on the political intrigues of that time period, the stories have been woven of these amazing works of hand-carved scenes. 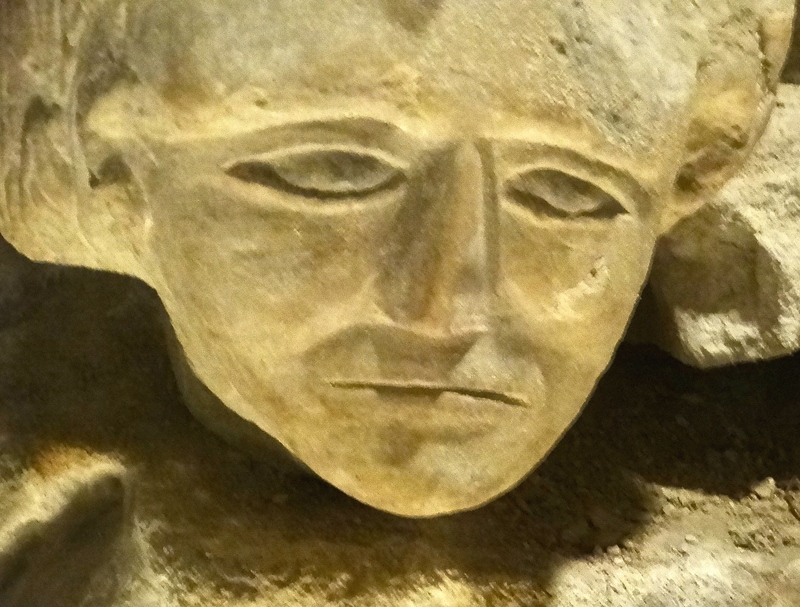 Our guide speaks to us about the lack of funds to continue excavating this particular site and how she is trying to draw attention and support to save the sculptures that are deteriorating due to the humidity in the open caves. It’s obvious that she is passionate about the past, this place, and preserving it for the future. It would be an excellent project for a university anthropology department and we leave with a sense that her optimism will be met with success. We continue into the larger town of Doué-la-Fontaine, stopping for lunch and then skirting the carnival (American Circus) blocking several streets for entertainment on this Easter weekend. We wind our way through narrow streets to an extremely old area of town with walls dark and rustic that clearly have been standing for centuries. 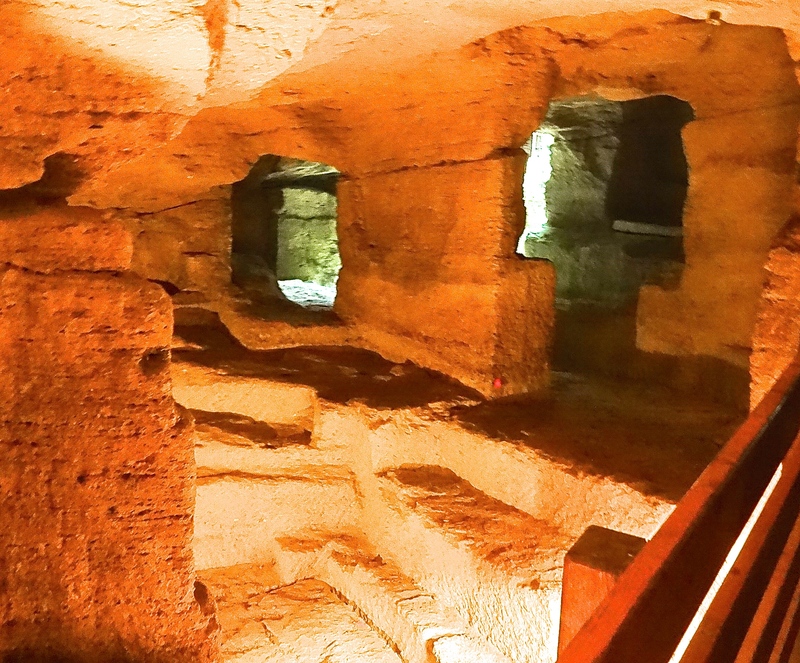 We park and head into the caves of the Troglodytes et Sarcophages, which date from the sixth century and were initially used in the carving of sarcophagi for the wealthy. This cave is sandstone and we join a tour where the guide is speaking French to a number of tourists. Throughout the tour, he clarifies a few things to make sure we are following along. He speaks of the history of this place, painting a portrait of the past and describing those who worked in the caves and those who sleep in the coffins. He continues the story through the Norman and Viking invasions, speaking about the security that the people of this village found below ground and how they reconstructed the entrances to create a barrier that ultimately ensured their survival. And, he spoke about a return to the caves during WW2 where some villagers returned temporarily to the old Troglodyte ways. This place was beautiful, much larger than we anticipated and filled with many more stories than we had expected. The cave openings now bring in the sunlight and reflect off the pale surfaces of stone, creating a golden glow through many rooms. Moss grows heavy in some areas creating an almost lush environment and an energy that resonates with the past. As we head north, a short detour finds us at our final stop, the underground troglodyte village in Rochemenier. This village is now set up as a museum of sorts that includes approximately 20 rooms and a very large underground chapel. The village presents the lives, complete with photographs, of those who lived here well into the 1930’s. Two ancient farms, replete with animal pens, can be viewed, along with the homes of those who were part of this thriving underground village. At the end of the self-guided tour, we see two updated homes that are reminiscent of Earthships introduced in Taos, New Mexico, which are mostly built underground with only the front visible and facing the sun. These newer, more modernized versions of the troglodyte homes are not quite as sustainably-designed, but with the consistent ambient temperatures below ground, you can see how one could easily be comfortable here. 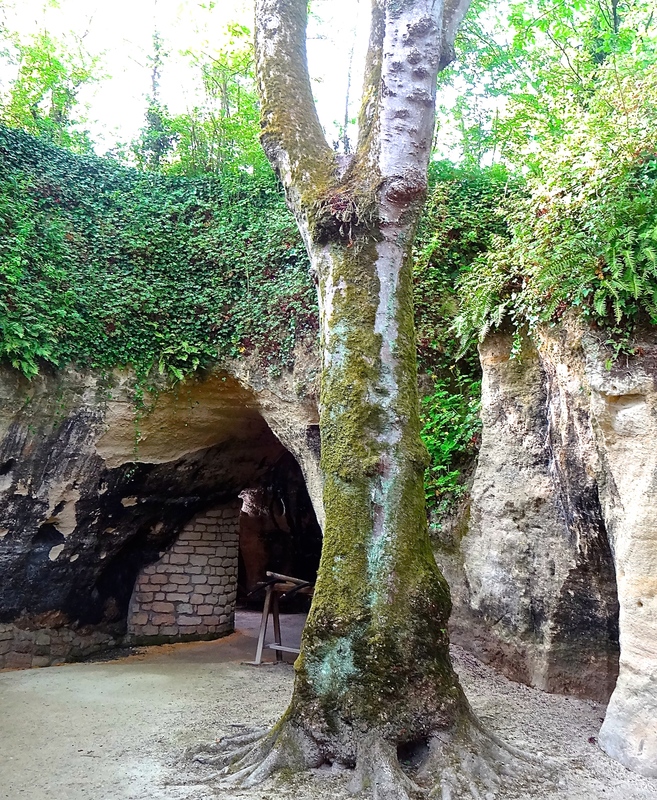 While there are many, many more of these troglodyte dwellings carved into the rocks and slopes of the landscape of the Loire Valley, we felt that we experienced an excellent overview of the types of caves available and we drive back to our hotel excited about sharing our experiences. This entry was posted in Loire Valley, Travel and tagged Art, Caves, Dénezé-sous-Doué, Doué-la-Fontaine, Earthships, France, La Cave aux Sculptures, Le village troglodytique de Rochemenier, Loire Valley, The cave of sculptures, Troglodyte caves, Troglodyte village in Rochemenier, Troglodytes, Troglodytes and Sarcophages, Troglodytes et Sarcophages, tuffeau.